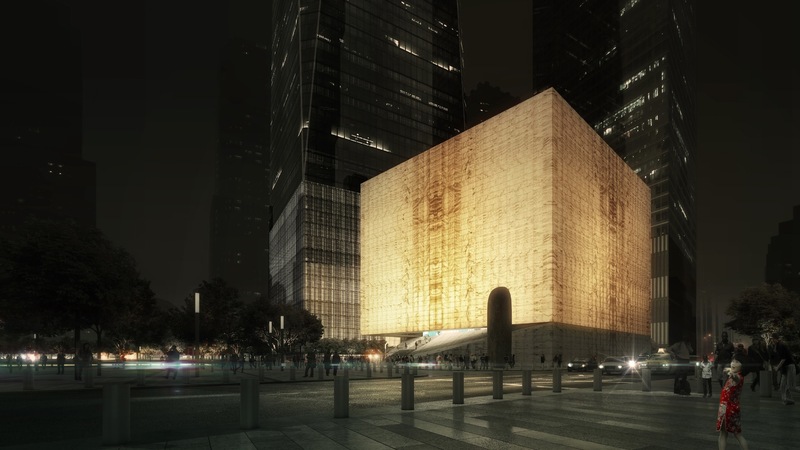 Construction on the Saint Nicholas Greek Orthodox National Shrine at New York City’s World Trade Center was stopped last week, as the Greek Orthodox Archdiocese of America (GOA) defaulted on their construction payments. 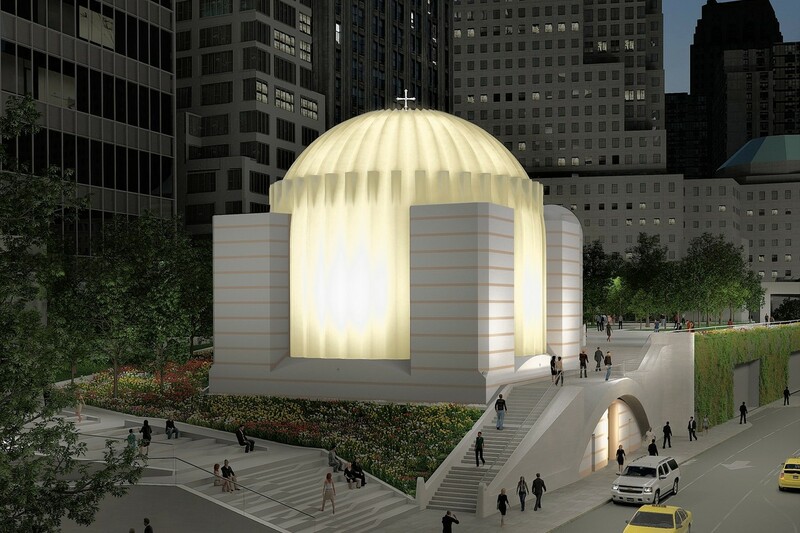 As first reported by The Pappas Post, the Archdiocese’s mismanagement of already-allocated funds has left the future of the Santiago Calatrava-designed shrine in doubt. The reconstruction of St. Nicholas has been hampered by setbacks and controversies since the destruction of the original 1916 church on 9/11. 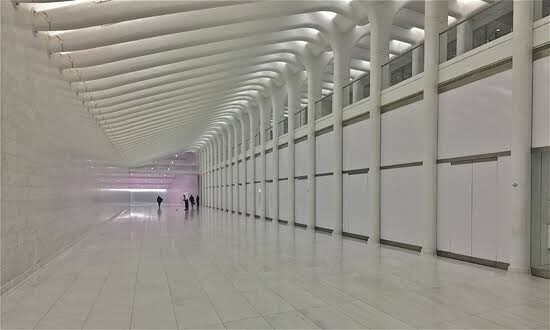 After years of negotiations between the Archdiocese and the city government over plans for the World Trade Center complex, a formal, $1 a-year, 198-year lease for the church’s land was granted to the Archdiocese just this year. With the reveal of Santiago Calatrava’s ribbed, Hagia Sophia-reminiscent design for the project in 2013, it seemed like plans were finally moving ahead. 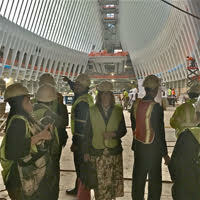 The new shrine, with Skanska USA as the head construction firm up until this point, had broken ground without a formal lease in 2014 and topped out in 2016, with plans to open in 2018. Skanska has now broken with the archdiocese over their employer’s failure to pay. In an open letter obtained by The Pappas Post, Thomas Perry, the project director, wrote: “Effective December 5, 2017, Skanska USA Building, Inc. (‘Skanska’) has terminated its contract with The Greek Orthodox Archdiocese of America (‘GOA’), on account of GOA’s defaults in making payment under the Owner Contract. Skanska is demobilizing from the Project site. “Skanska is continuing its pursuit of payment from GOA under the Owner Contract, together with any other remedies it may have on account of GOA’s breaches. We will advise you when there is progress toward a resolution with GOA.” According to The Pappas Post, the Archdiocese’s failure to pay is the symptom of a financial crisis rocking the GOA, as restricted funds have been used to pay off a widening deficit. Despite bringing in $30 million a year, as much as $3.8 million has allegedly been moved out of construction funding for the shrine, and the Archdiocese is reportedly facing bankruptcy, a charge that the GOA denies. Still, in the face of employee layoffs and the recent construction freeze, it seem that the group’s finances could be facing closer scrutiny by outside groups moving forwards. As a result of the stoppage, the Archdiocese has since retained the firms of PricewaterhouseCoopers LLP (PwC) and BakerHostetler LLP to independently look into how the allocated money was spent. The GOA has said that it remains committed to the church’s reconstruction. The park slipped on top of the World Trade Center Vehicular Security Center is a rare thing within the World Trade Center campus. 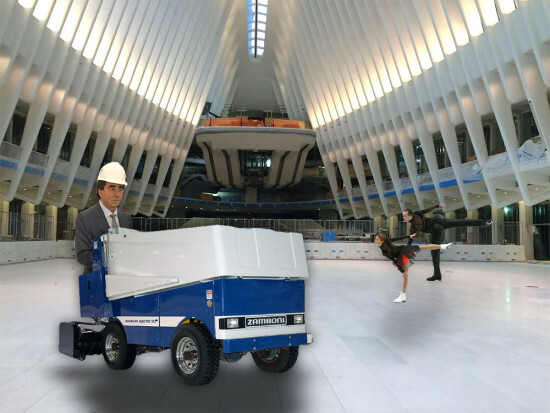 Up until now, traversing the WTC site has presented the hapless wanderer with despair. To discover an east-west passage meant confronting an interminable and illegible security and construction barrier. 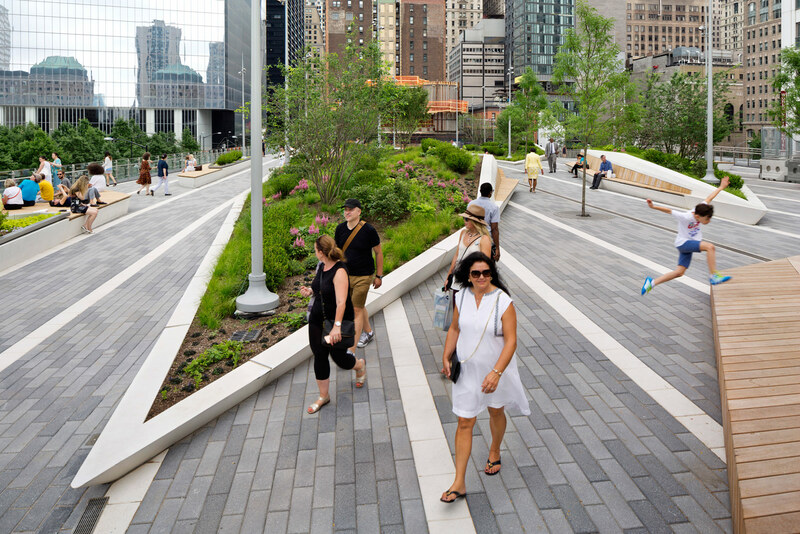 Liberty Park is both an unexpected place for rest and relaxation and a visually appealing pedestrian corridor. Its infrastructure-as-park fascination is reminiscent of the High Line and its formalistic planter-and-seating shards recall Zaha Hadid’s cosmopolitan futurism. Clearly marked stairs step up the screening building and connect to a bridge across the West Side highway to the Hudson River. Along the way, the passageway folds out into a rooftop park, punctuated with stylized white concrete planters and benches that plunge out into sharp points and a long terrace that overlooks the entire campus. Its graded pathway makes the building feel like a gently sloping hillside. It may be the mercifully limited programming and lack of overdetermined symbolism that give it the promise of urbanism—its resonance will come from being inhabited and iterated over time. 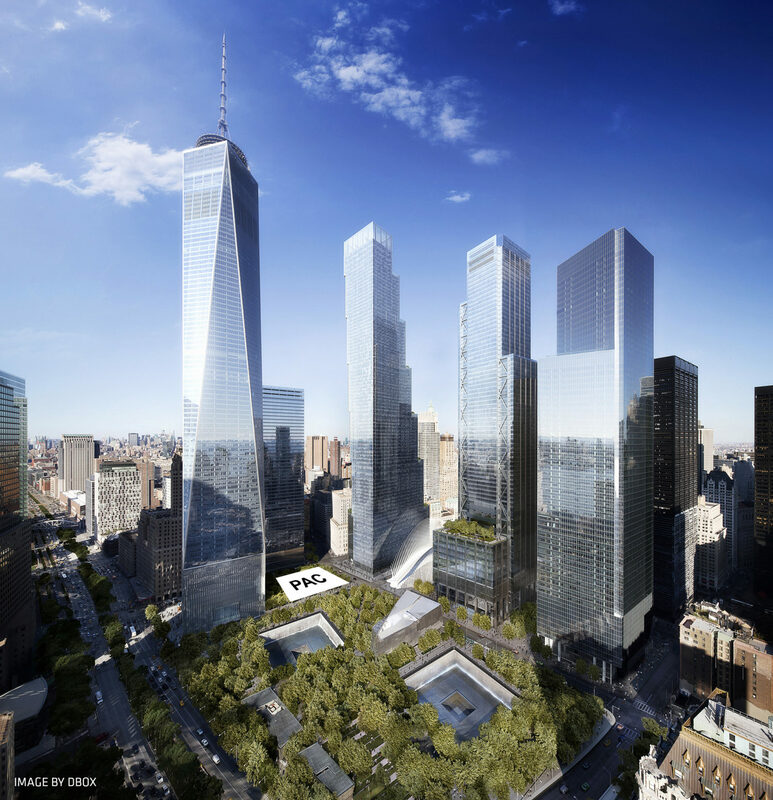 What Liberty Park provides are two qualities that the reborn World Trade Center lacks: A sense of place and a free passage for walking. 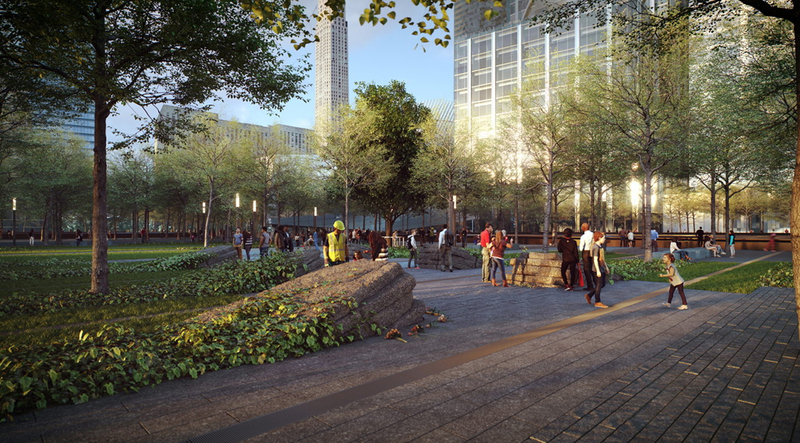 Designed by Gonzalo Cruz of AECOM’s landscape studio as a part of the WTC transportation infrastructure portfolio brought to the firm by Joe Brown during its merger with EDAW, the park itself is a legacy that dates all the way back to the original Daniel Libeskind masterplan. It was meant to buffer the memorial site and provide an open public space adjacent to Liberty Street. 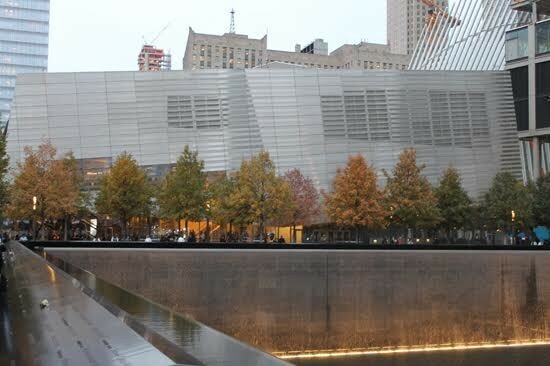 But as security measures intensified throughout the WTC site, the Vehicular Security Center got pushed to the edge, and the park ended up plopped on top of it. As the building elements shifted during its design, the park deformed to become a complex landscape, graded and situated to disguise the robust security apparatus below. The Port Authority covered its reported $50 million price tag. The adjacent street, once imagined as a restoration of the street grid, will be permanently blocked by a guard booth and vehicle entry barriers, but at the street level, the truck-shipment screening facility is clad in a G-O2 Living Wall, covered by rows of periwinkle, sedge, and ivy. It may be fitting that this odd park cropped on top of a security building achieves what’s missing from the intensely programmed whole. As a leftover space, the designers were unencumbered by the duties of solemn remembrance, architectural spectacle, real estate bravado, and tourism. 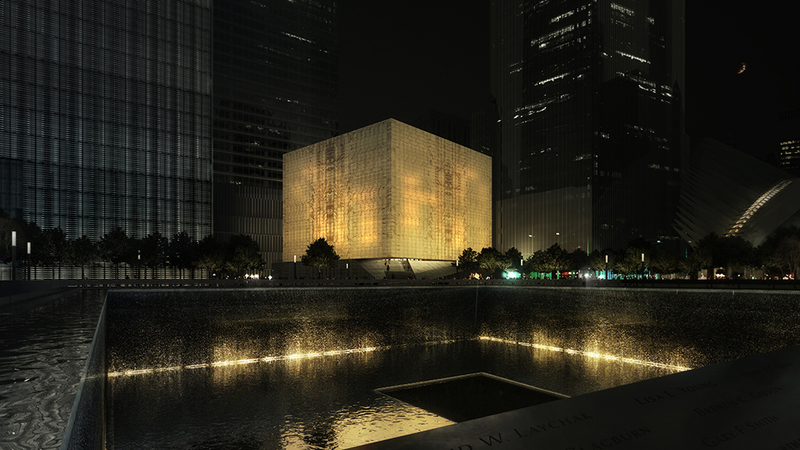 It anticipates the day when the World Trade Center is reborn as a part of the city, which could be a greater honor than any designated monument. 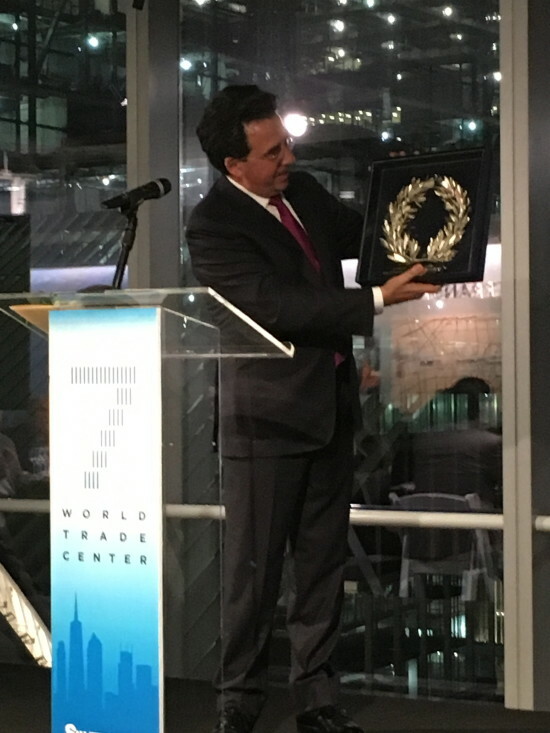 Tuesday night at a ceremony on the 33rd floor of World Trade Center 7, high above his World Trade Center Transportation Hub, Spanish architect Santiago Calatrava was awarded the European Prize for Architecture by the Chicago Athenaeum Museum of Architecture and Design and the European Centre for Architecture. The accolade is awarded to architects each year who have made substantial contributions to the field. Last year's winner was Alessandro Mendini, who was given the award at a ceremony in Milan. In the crowd was a host of construction industry professionals, each with a table. Calatrava and his family had a table in the front, and Calatrava was giddy as the representatives of the Chicago Athenaeum and European Centre praised his long and prolific career. The highlight of the night was then he was presented with a crown made of olive leaves from the Parthenon in Athens. Calatrava gave a short lecture about his work, from his first projects in Zurich and Spain to his over 50 bridges around the world. He explained how he was trained as an engineer, but was eventually inspired by the human form and eyebrows, which evolved into his signature reptilian style.